Some of the most spectacular Pennsylvania Wilds scenery can be seen from horseback in the Backwoods, Backroads and Backwaters of Clearfield County. Equine loving guests should plan to visit for a week, or at the very least, an extended weekend. The backwoods, backroads and backwaters have plenty of places to ride, board or camp. Riding the trails in Quehanna and at Wopsononock is free. 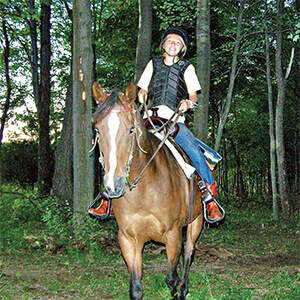 Riders may also want to saddle up and let a guide lead the way, since some areas are more remote. The Quehanna Wild Area extends into three counties, and has more than 75 miles of DCNR maintained trail. With waterfalls, virgin birch, and the largest free-roaming elk herd in the Eastern US, this is a great place to get back to nature. There are six primitive equine camping sites available, with four stalls and two tie lines. Sites must be reserved thru DCNR and are free of charge. If you prefer it a little on the softer side, there are other campgrounds and stables nearby, as well as organized trail rides. Wopsononock Natural Area in southern Clearfield County, is 588 acres of varying trails and terrain. Previously a Boy Scout Camp, this heavily wooded area is now open for riding and other day use. There is trailer parking available at the entrance, and camping and amenities nearby. Wildlife viewing from horseback can give riders a deeper feeling of being at one with nature than any motorized excursion. 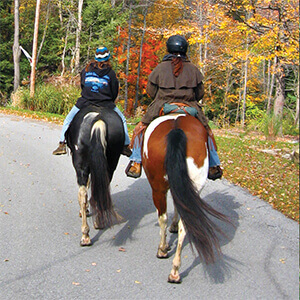 The riding in Clearfield County and the surrounding area is beautiful in all four seasons. In spring everything is bursting into bud. Mid-June is an exceptional time to see the Mountain Laurel in full bloom along the trails in Quehanna and at Wopsononock. Animal life is teeming in spring as well; hibernation season is over, and mothers are teaching their young how to navigate and safely explore the region’s hills and valleys. For help in planning your visit to the Backwoods, Backroads and Backwaters visit www.visitclearfieldcounty.org or email ccrta@clearfieldco.org.